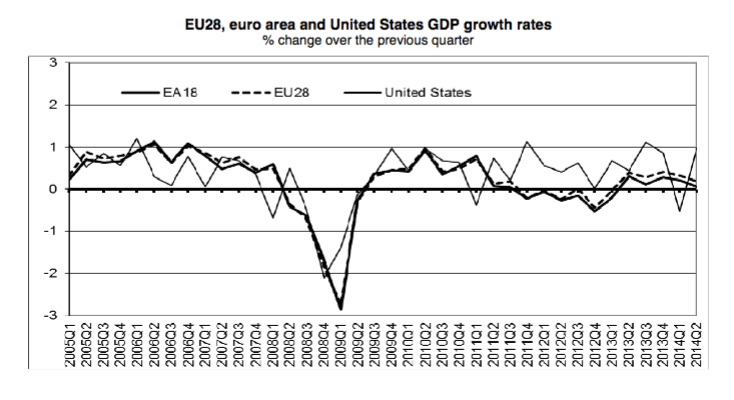 In 2007, EU economies, on the surface, seemed to be doing relatively well – with positive economic growth and low inflation. Public debt was often high, but (apart from Greece) it appeared to be manageable assuming a positive trend in economic growth. However, the global credit crunch (see: Credit crunch explained) changed many things. Fall in House Prices. The recession and credit crunch also led to a fall in European house prices which increased the losses of many European banks. Rise in Debt to GDP ratios. 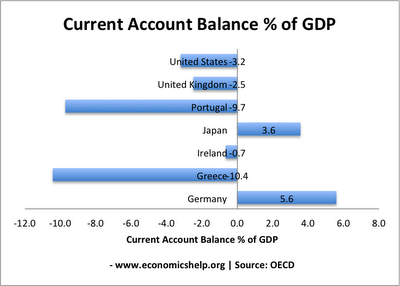 The most useful guide to levels of manageable debt is the debt to GDP ratio. Therefore, a fall in GDP and rise in debt means this will rise rapidly. For example, between, 2007 and 2011, UK public sector debt almost doubled from 36% of GDP to 61% of GDP (UK Debt – and that excludes financial sector bailout). Between 2007 and 2010, Irish government debt rose from 27% of GDP to over 90% of GDP (Irish debt). 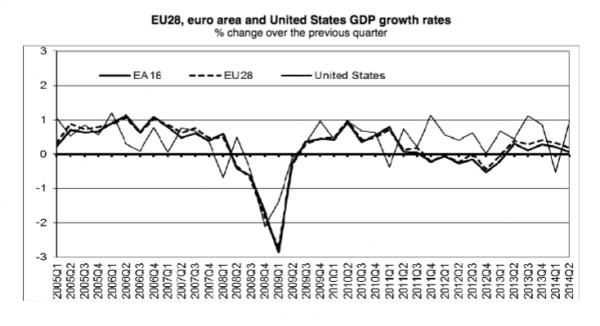 Markets had assumed Eurozone debt was safe. Investors assumed that with the backing of all Eurozone members there was an implicit guarantee that all Eurozone debt would be safe and had no risk of default. Therefore, investors were willing to hold debt at low-interest rates even though some countries had quite high debt levels (e.g. Greece, Italy). In a way, this perhaps discouraged countries like Greece from tackling their debt levels, (they were lulled into false sense of security). No Strategy. Unfortunately, the EU had no effective strategy to deal with this sudden panic over debt levels. It became clear, the German taxpayer wasn’t so keen on underwriting Greek bonds. There was no fiscal union. The EU bailout never tackled fundamental problems. Therefore, markets realised that actually Euro debt wasn’t guaranteed. There was a real risk of debt default. This started selling more – leading to higher bond yields. No Lender of Last Resort. Usually, when investors sell bonds and it becomes difficult to ‘roll over debt’ – the Central bank of that country intervenes to buy government bonds. This can reassure markets, prevent liquidity shortages, keep bond rates low and avoid panic. But, the ECB made it very clear to markets it will not do this. 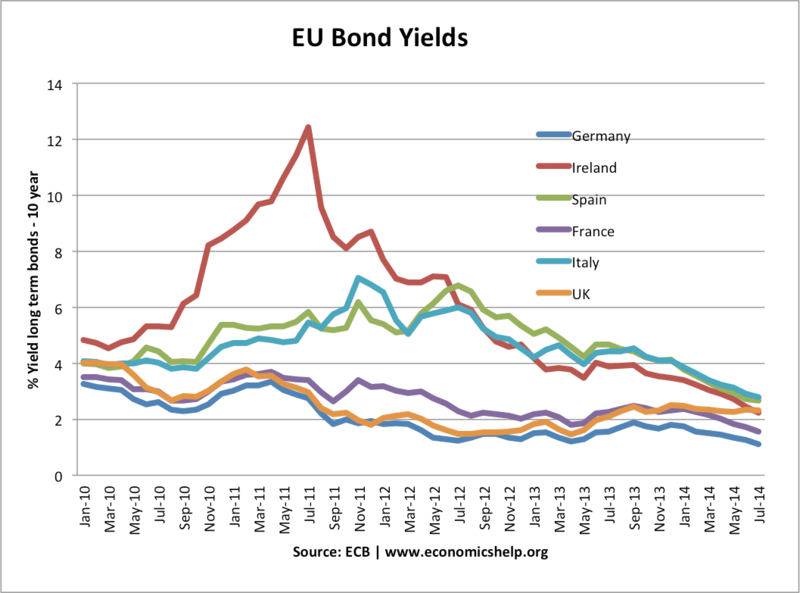 (see: failures of ECB) Countries in the eurozone have no lender of last resort. Markets really dislike this as it increases the chance of a liquidity crisis becoming an actual default. 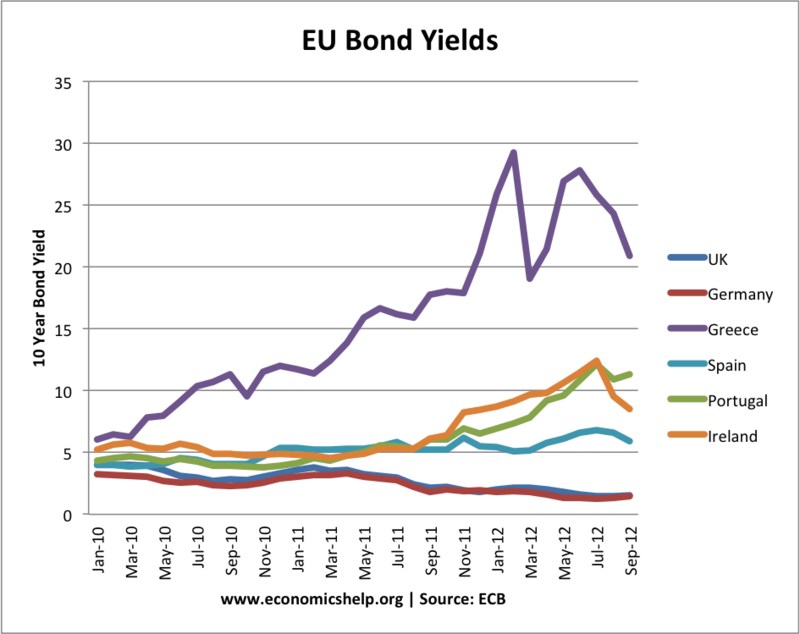 For example, UK debt has risen faster than many Eurozone economies, yet there has been no rise in UK bonds yields. One reason investors are currently willing to hold UK bonds is that they know the Bank of England will intervene and buy bonds if necessary. People have been selling Greek and Italian bonds for two reasons. Firstly because of high structural debt, but also because of very poor prospects for growth. Countries facing debt crisis have to cut spending and implement austerity budgets. This causes lower growth, higher unemployment and lower tax revenues. However, they have nothing to stimulate economic growth. They are only left with internal devaluation (trying to restore competitiveness through lower wages, increased competitiveness and supply side reforms. But, this can take years of high unemployment. Greece. Greece had a very large debt problem even before joining Euro and before the credit crisis. The credit crisis exacerbated an already significant problem. 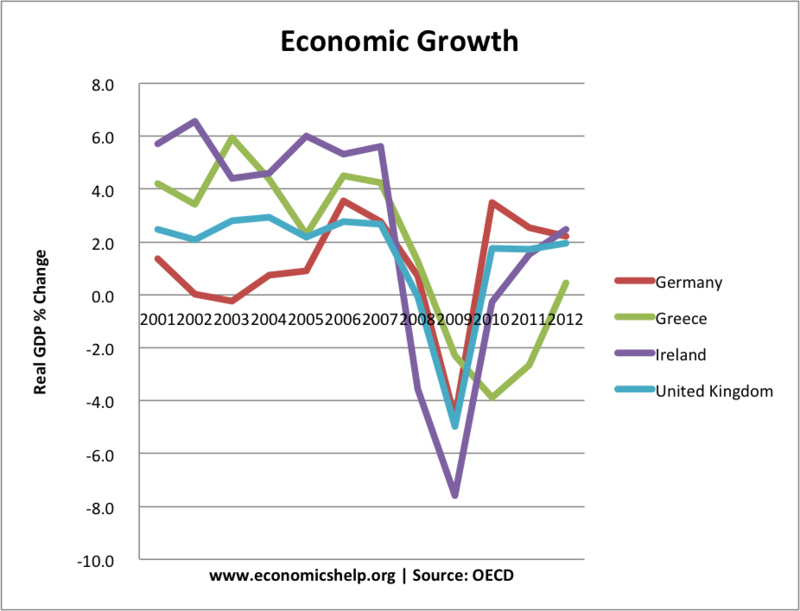 The Greek economy was also fundamentally uncompetitive. High structural debt before the crisis. Exacerbated by the ageing population in many European countries. Recession causing sharp rising in the budget deficit. Credit crunch causes losses for Commercial banks. Investors much more cautious and fearful of default in all types of debt. 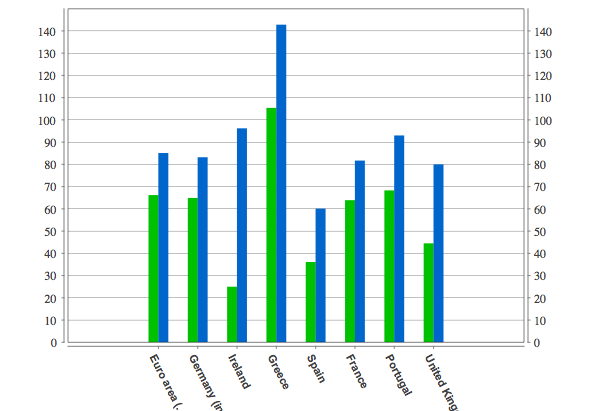 Southern European economies uncompetitive (higher labour costs) but can’t devalue to restore competitiveness. This causes lower growth and lower tax revenues in these countries. No Lender of last resort (like in UK and US) makes markets nervous of holding Eurozone debt. No effective bailout for a country like Italy. Fears of default raise bond yields, but this makes it much more expensive to pay interest on debt. e.g. cost of servicing Italian debt has risen meaning they will have to raise €650bn ($880bn) over next three years. It becomes a vicious spiral. Higher debt leads to higher interest rate costs making it more difficult to repay. One issue has been helped. Action by the ECB has led to a fall in bond yields. This willingness to intervene in the bond market has calmed investors and led to lower bond yields. However, the economy remains stagnant with low growth. The global economic crisis is biting everywhere. However, it seems that our politicians haven’t a clue how to deal with the many problems arising from the economic crisis. Maybe they need to turn to professional economic crisis specialists. For example, the Orlando Bisegna Index, specialists in the economic crisis, have helped various counties with debt problems, business failures and unemployment, so have helped the condition of families!